Our anti slip rug underlay will prevent your rugs and carpet runners from slipping and sliding on all types of floors including wood, vinyl, laminate, carpet and tiles and will also protect the backing of your rug to ensure it lasts for many years of enjoyment. 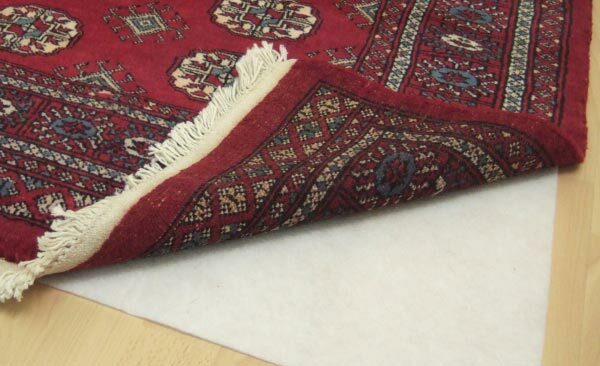 The 2mm fleece gripper will stop your rugs from moving which will prevent stumbling and falling on bulging areas. As a rug slides on your floor it can develop ridges which will weaken the backing and cause extensive damage which can prevent the rug from sitting flat. A special coating is used to provide the maximum support without leaving any sticky residues on your floor unlike spray products and is T�V certified, ensuring the product has been fully tested for harmful solvents. Our underlay is suitable for underfloor heating with hardly any heat detraction and is machine washable at 30� Celcius. It is really easy to lay the underlay in place on your floor and you can easily cut to size/shape using a pair of household scissors, we recommend allowing the rug to overlap by approx 8mm to ensure the underlay is not visible. We have a huge choice of sizes for rugs and hallway runners and you can use multiple pieces to ensure you cover the dimensions you require.